Last weekend something really interesting happened. One of my neighbors decided to dump his old TV in the back alley. Very interesting decision, considering that two weeks ago there was a recycle day for electronics one block from our place (which by the way had an awesome response from the neighborhood as you can see in the picture). 1-The TV was working until that specific day and then it stopped working, so the person had to buy another one and dumped the old one somewhere. 2- The person didn’t know about the drop off. 3- The TV was working and the person wanted that someone to use it. 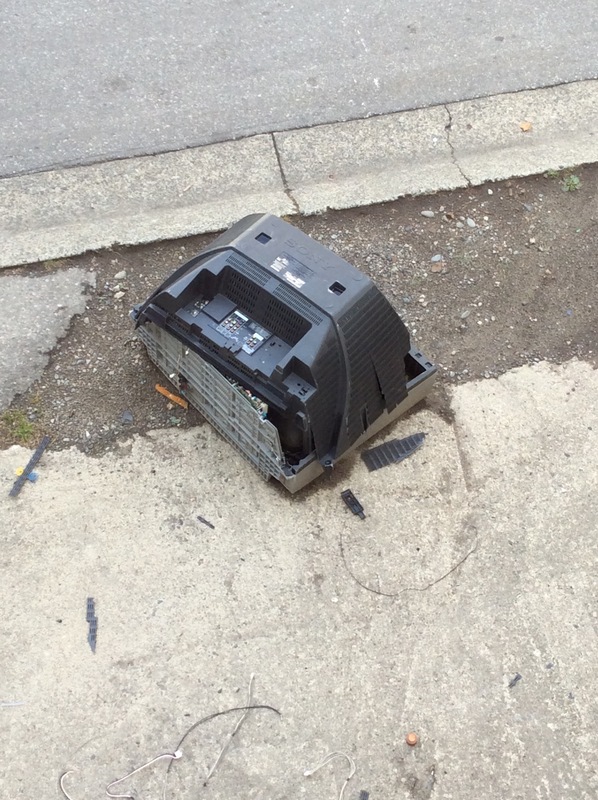 So the person dumped the TV in the back alley expecting that someone will reuse it. 4- The person didn’t care about recycling and environment. The first reason seems reasonable, except the fact that there are specific places to throw old TVs. 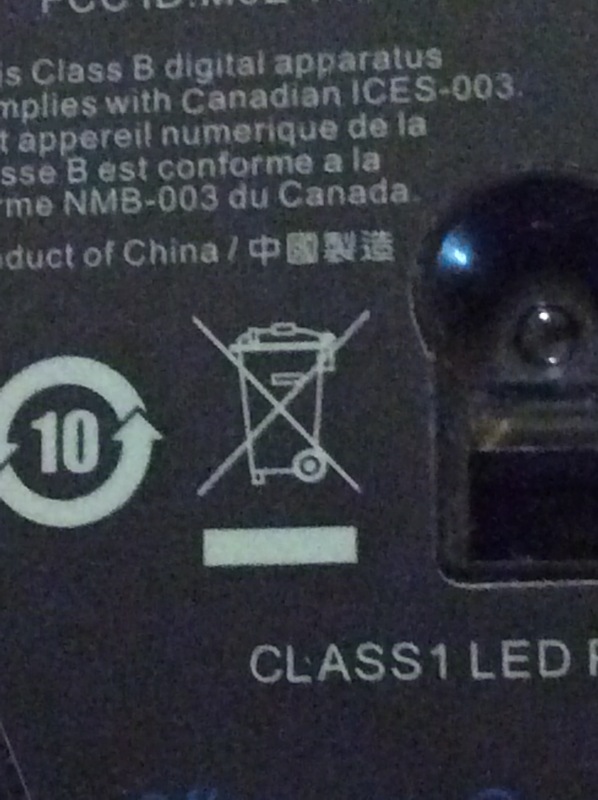 I know, those places sometimes are not obvious as I wrote here, but the majority of electronics appliances have a symbol showing they won’t belong to normal garbage. The second reason is very unlikely considering that there were posters informing the drop off inside and outside the building and also posters around our neighborhood. Also there are drop off days in our neighborhood (minimum twice per year), so I think it is possible to store the TV and wait for the next drop off. The third reason is indeed a great act. I do the same sometimes but not with monsters super heavy old TVs. I do with books, DVDs or clothes. Super heavy TVs are not easy to transport. Besides how someone would know that the TV is working perfectly? Adding a sign? I had a similar experience before. I owned an old heavy TV (few years ago). I put my TV in my storage and I put add an ad in a website offering the TV for free. So a couple of days later a guy came and picked up the TV. Of course I don’t even want to comment the fourth reason. Later during the day, I was at my apartment and I heard some bangs outside. A homeless guy was trying to open the TV (probably there was something valuable to sell inside the TV ). The guy did his job and of course left the TV there in multiple pieces. After the “service” it was clear that the TV would go to a common garbage landfill. It is not the correct option because those TVs have poisonous metals and frequently those metals will contaminate aquifers. I started to think whose fault is this? The former TV owner? The homeless guy? The government (of course, blaming the government is kind of default always)? I am not sure, but that is the reason i am writing this post. There are alternative solutions. I gave here some possible reasons to dump an old TV in a common trash and some possible solutions to drop off the TV in the right place. I know is not easy but I hope to spread more the message make the world a cleaner place. Where Should My Broken Blender go?